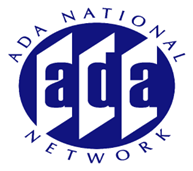 The Mid-Atlantic ADA Center has produced two new resources to enhance customer service and the accessibility of meetings, events and conferences. A new 20 minute film features individuals with disabilities discussing how they would like to be treated. This free online streamed video and two minute preview will be a helpful tool for enhancing your customer service. The Accessible Meetings, Events and Conferences Guide is an online resource providing an overview and resources for those planning meeting and events. It reviews requirements and best practices to enhance the inclusion of persons with disabilities.